Not long before the Holiday Season Madness descended upon us, Boy and I were invited to and attended a book signing party held at Olana, the celebrated, exotic fantasy of a stately home built by Frederic Edwin Church (1826-1900). As readers of this blog are well aware, Mr. Church was one of our Nation's most revered and talented artists and one of the founders of the Hudson River School of landscape painters. In his day he was as famous as a rock star, became rich as Croesus, and built Olana as a trophy of his well-deserved success. Olana sits on the top of a hill commanding a magnificent view out over the mighty Hudson River. The house, which was designed in collaboration with Calvert Vaux (1824-1895), another creative Titan of the nineteenth century (he co-designed New York's Central Park), has been beautifully preserved and restored (with much of its original contents intact), and is open to the public. 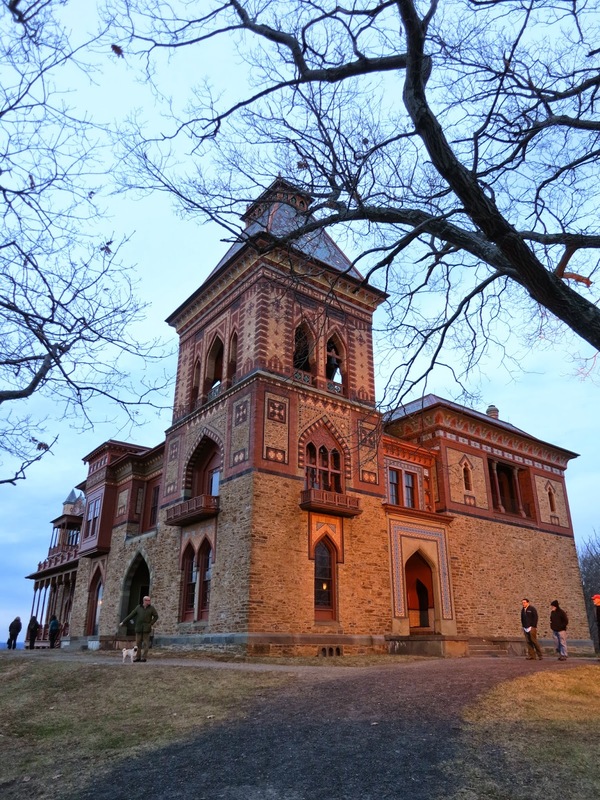 Olana is one of New York's—no, this country's—historic treasure houses. If you haven't made a pilgrimage to see it yet, Dear Reader, I highly recommend that you do so. But be sure to book your tickets well in advance, as Olana is a popular destination and its tours frequently sell out. 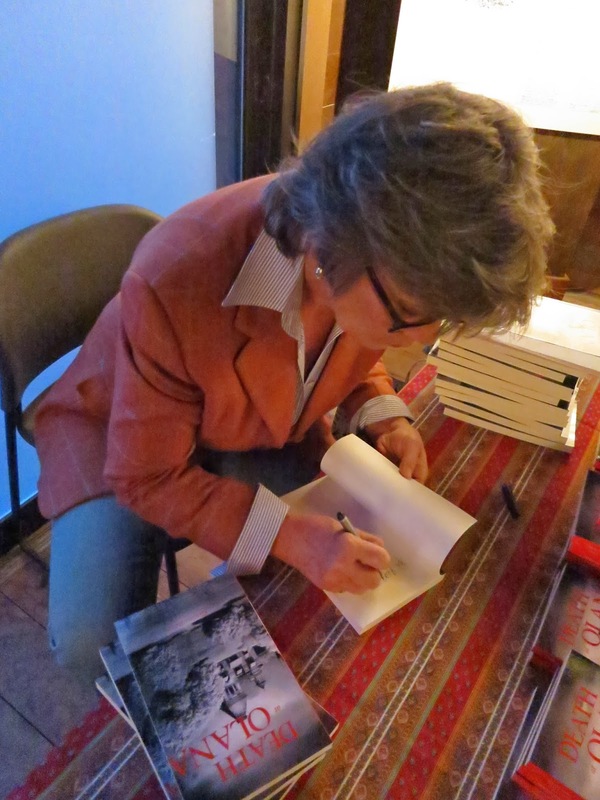 The book signing party was held in Olana's visitors' center, an attractively converted former carriage house on the estate's property. The featured book was written by a dear friend of ours, Ms. Glenda Ruby, and is a delicious read. 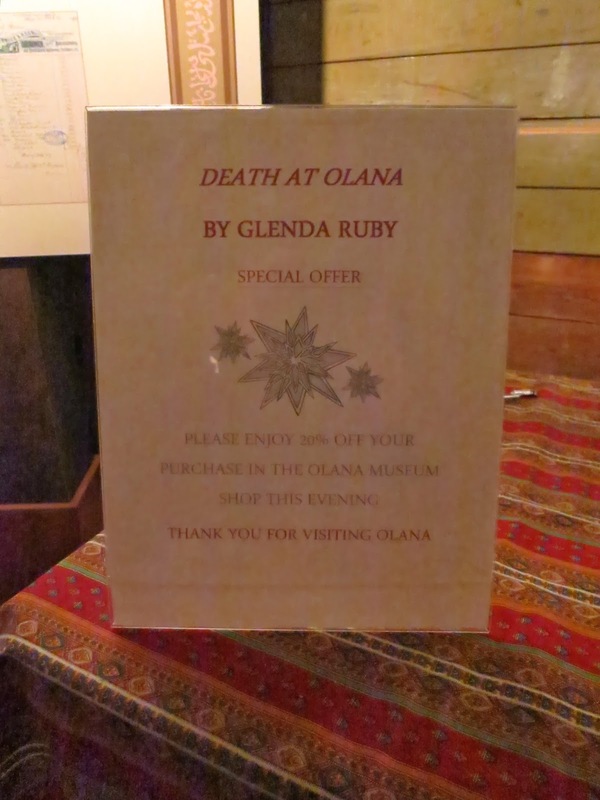 It is a murder mystery, titled Death at Olana—which explains why the party was held there (although there is no formal connection between the author and Olana). The book is very clever and amusing, and it marvelously captures the spirit and the doings of those of us who variously inhabit the surrounding Columbia County, an area known for its gorgeous rural scenery, a jumble of city folk and locals, and all the crafty shenanigans that one would expect in an area where such cultures (sometimes) collide. One enjoyed a 20% discount in the Olana gift shop! "Most of the charming people and the ne'er-do-wells, the heroes and the villains in this tale, abide in Columbia County. While this is still very much the country, agricultural and rural, about thirty years ago there began a diaspora of New York cognoscenti who chose to spend time in quaint hamlets and villages, rather than amid the haute bourgeois excess of say, Long Island, to choose a random example." "And so among the apple, pear, peach, and cherry orchards, the dairy farms, and the good local people who run them, you will increasingly find upper middle, indeed wealthy families, singles, straights and gays, painters, writers, publishers, lawyers, media types, and investment bankers [editor's note: such as Reggie] who have migrated to this historic area. We all believe we live in the most beautiful place in the world. "Some of us are murderers." "Christmas at Olana, Frederic Church's Moorish fantasy castle . . . a new Church painting unveiled . . . beside a naked body hanging by a noose. "So begins the first of the Hudson Valley Murders, a new series for lovers of mystery and malicious wit." We arrived at the party on the later side after what I understand was a veritable crush of well-wishers and friends of the author. Food and drink was plentiful, and I enjoyed myself immensely. So much so, in fact, that I gleefully bought half a dozen copies of Death at Olana as Christmas presents, and had them inscribed by Ms. Ruby. She gamely complied, I am happy to report. One runs into and meets all sorts of people at parties I find. I had a brief and pleasant conversation there with Mr. Stephen Shadley, the noted interior designer, who is someone I first met thirty or so years ago. Goodness! I find that I am saying things like "more than thirty years ago" more frequently of late than I care to admit! Where does the time go, I ask you? One of the other guests at the party was the divine Ms. Ros Daly. 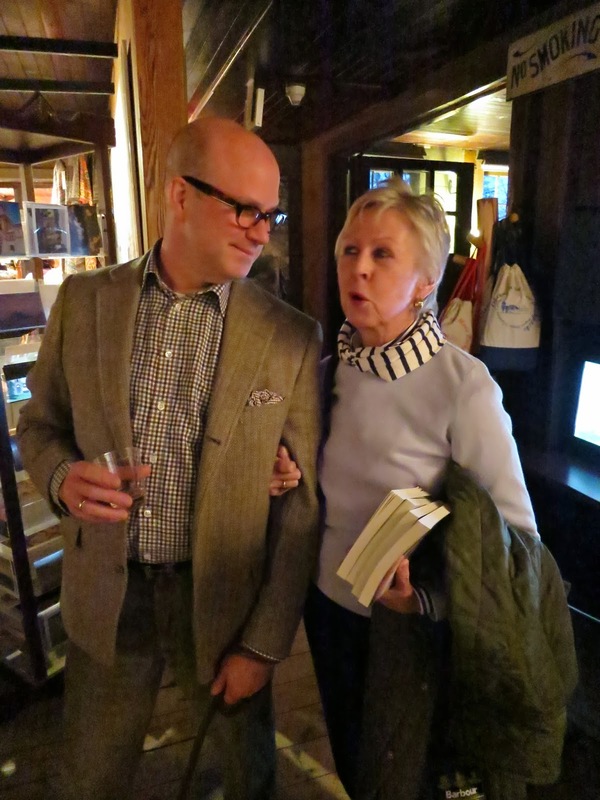 You can see her in the preceding photograph holding my copies of Death at Olana, which she graciously agreed to hoist while I snapped her picture with the admiring Boy Fenwick at her side. I am beyond fond of Ms. Ruby, who is a wit, a bon vivant, a raconteur, and makes the best Boeuf Bourguignon that I've ever had the pleasure of eating. Plus, she's a Southerner and has the most marvelous whiskey and cigarettes voice imaginable. She is Heaven! Ms. Ruby does a superb (and quite humorous) job of depicting (some would say skewering) the insulated little world we live in during weekends up in Columbia County, among the fields and orchards, and—occasionally as it turns out—naked dead bodies swinging from ropes! "Oh, hello Reggie, so glad you could come!" 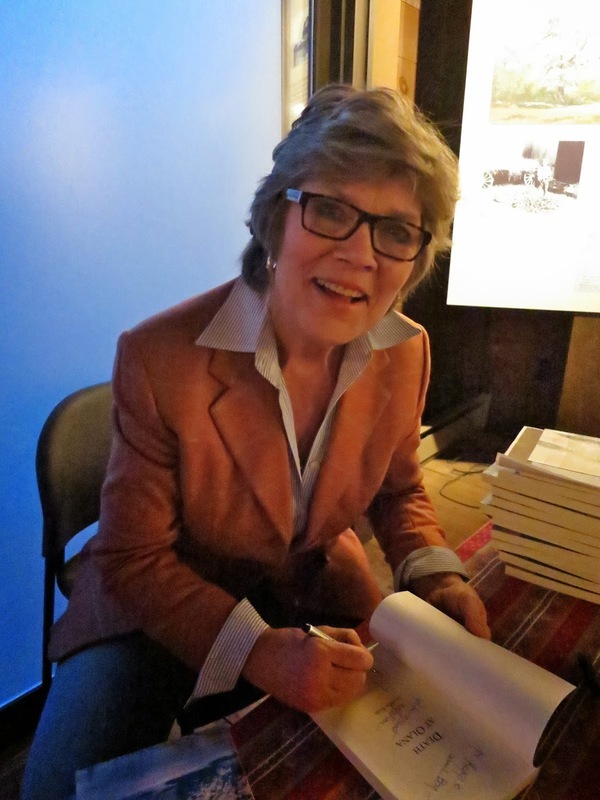 After reading Death at Olana, I sincerely hope that Ms. Ruby follows through on her threat that it will be the first in a series of Hudson Valley Murder Mysteries. I want more! If you are interested in a light and entertaining read (and who isn't?) full of colorful characters, amusing situations, and a healthy dose of keenly observed insights into the human condition (at least as it is found two hours north of Manhattan in the county where Reggie spends most of his weekends), then I highly recommend Death at Olana. I assure you, Dear Reader, you will not be disappointed! Oh, and while you're at it, do buy at least several copies of the book to give to your friends and loved ones, too, as I'm sure they'll enjoy it as well! 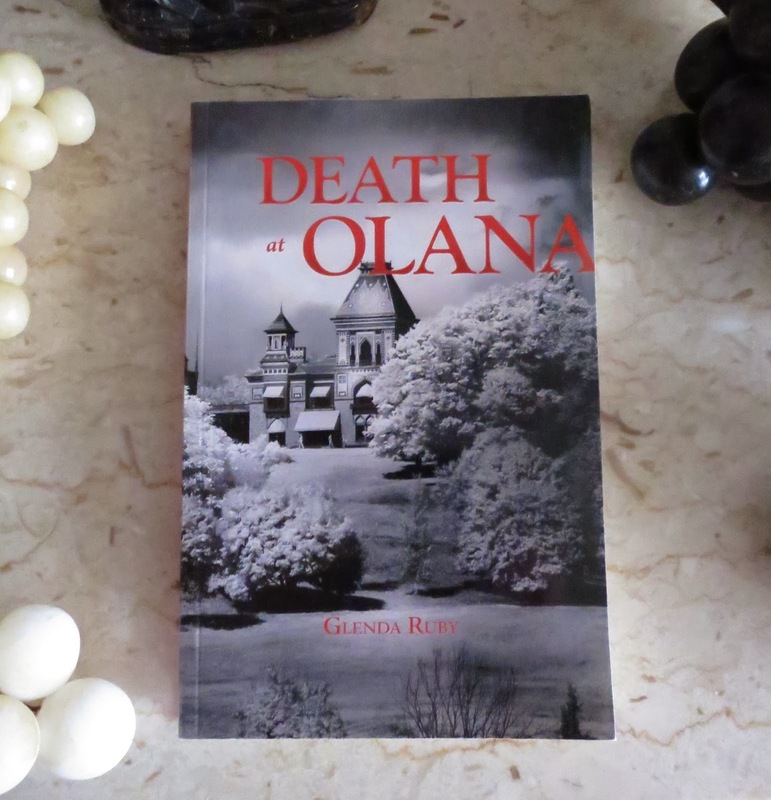 You can order copies of Death at Olana here. 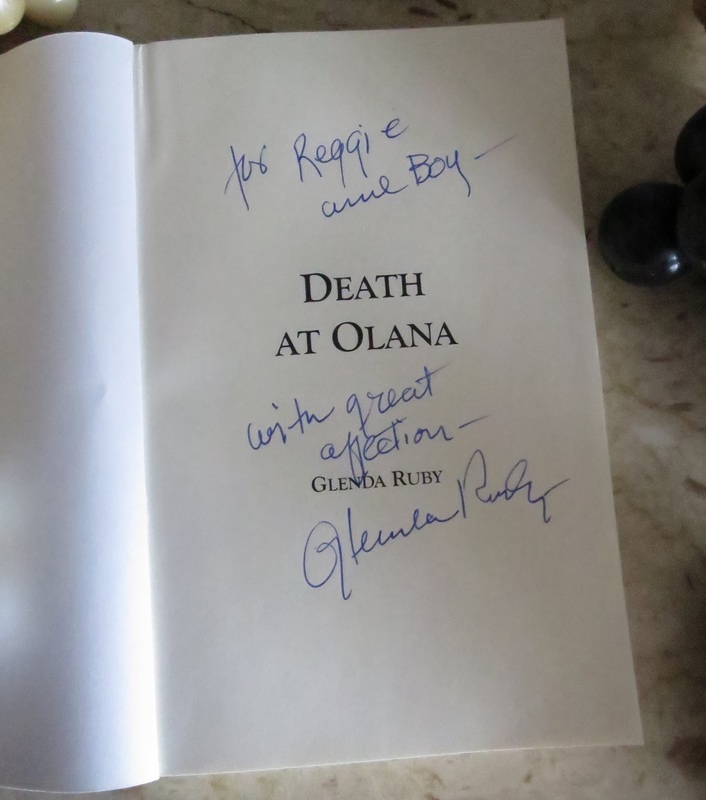 Please note: Reggie admits that he received a copy of Death at Olana as a gift from Ms. Ruby many months ago. However, he insists that isn't why he wrote this review (or why he bought six copies of it at the party—at full retail price he might add). No, he has written this post solely for the amusement of his readers and to encourage them to buy Ms. Glenda Ruby's book based upon its own many merits. In my early teens I spent a lot of time by myself, alone. As I have written before, as the youngest of four children I was the only one living at home with my parents during the several years leading up to when I went off to Saint Grottlesex. We had recently moved to Connecticut from Washington, D.C., and into a beautiful, albeit glacial, modernist house at the end of a winding road on the top of a steep hill, with few nearby neighbors. My parents' marriage had taken a serious turn for the worse by then, and they were barely on speaking terms. They were often away, and I spent many evenings and weekends alone in our house. Even when my parents were present physically, more often than not they were not present emotionally. They had other things in their minds, I was later to learn. If you've seen the film Ice Storm you'll have a fairly good idea of what my home life was like at the time. At thirteen, then, I found myself rudderless in a strange new world where everything had suddenly gone haywire, and I was in a state of shock. I had been very happy in Washington, where we lived in a rambling house in a neighborhood full of children my own age, and I had loved the country day school I attended there, where I was popular and had a close knit group of friends. Now I found myself living in a strange modern house with parents who no longer spoke to each other in a strange and remote New England suburb where I knew no one, and I was attending a strange, decidedly mediocre school full of strange people who weren't all that interested in welcoming a newcomer into their ranks. I felt awkward and alien, as if I'd been dropped there from the sky. Given the physical isolation of the house where I lived and the fact that neither of my parents were at all inclined (or available) to shuttle me about to promote my social life, it was challenging for me to make any friends. Besides, it was assumed that I'd be leaving for boarding school in a year or two, so why bother? Nonetheless, it was a damnably solitary and lonely existence for Reggie, and he didn't care for it one bit. But that's not the point of this story, Dear Reader. No, it is the context for it. Reggie is a resourceful chap, and he isn't one to sit around bemoaning his fate, crying into his lukewarm, curdled milk. No, when things don't work out for Reggie as he planned, he finds a way to do something about it. Which is exactly what I did. The album that started it all . . .
One evening when I found myself, yet again, alone at home, I opened the door to the cabinet containing my parents' record collection, to see what I could find to amuse myself. Both my parents were jazz aficionados, and I grew up listening to albums by Dave Brubeck, Thelonious Monk, and John Coltrane, and also Peggy Lee, Anita O'Day, and Miriam Makeba. My father was also a fan of Frank Sinatra's Come Fly With Me era recordings, and he loved Benny Goodman's later, jazz records, too. 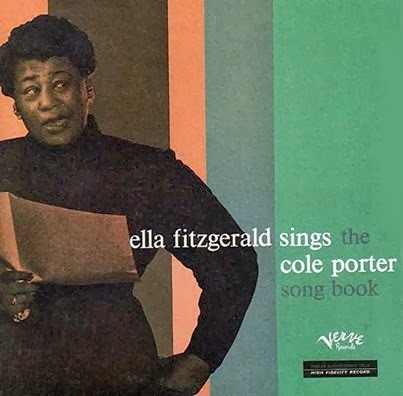 Flipping through the albums that evening I came across Ella Fitzgerald Sings the Cole Porter Songbook. I didn't recall ever listening to it, and so I put it on the turntable of our KLH stereo sound system to give it a try. I instantly fell in love with Miss Fitzgerald's lovely, rich, crystal clear voice, along with Nelson Riddle's lush arrangements, and I was transfixed. I couldn't get enough of it! 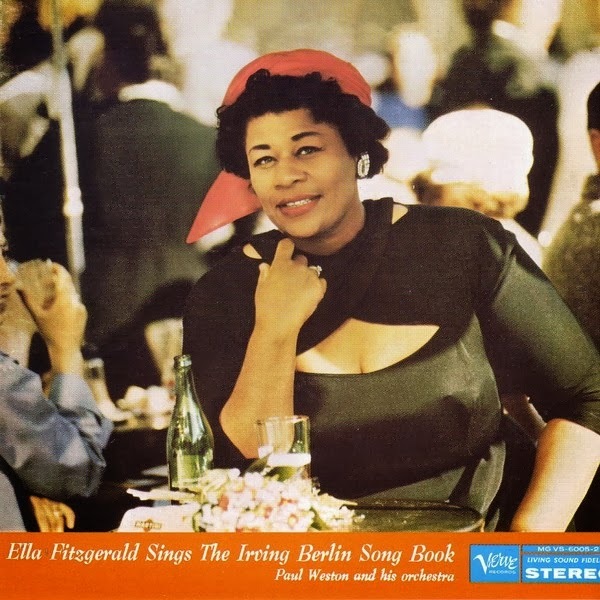 I found half a dozen more of her recordings on the cabinet's shelves, and over the next weeks and months I played them over and over until I knew every word of every song, and I could sing along to Ella's marvelous and impeccable phrasing without missing a beat. 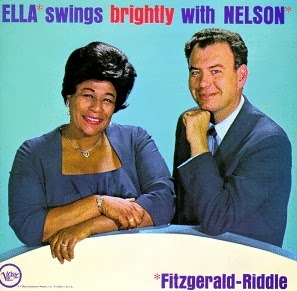 I soon found my way into the bins at record stores searching for more Ella Fitzgerald albums, and I amassed several dozen of them to add to my parents' collection. I bought many of the other Great American Songbook albums that she recorded, including most of what she made under the Verve label, and also earlier albums she recorded under the Decca label. While other thirteen year old boys I knew at the time were obsessed with the music of Cream and Jethro Tull, I was swingin' to the musical beat of Miss Fitzgerald, far away in my own little world. I soon broadened my listening to include her peers, including Frank Sinatra, Keely Smith, Julie London, Sarah Vaughan and Dinah Washington, and I also developed an appreciation for the horn-filled Big Band recordings of the great bandleaders of the 1940s. This was the music that came to define my teenage years and that I continue to enjoy today, along with more contemporary fare. I consider those few lonely years I spent in Connecticut as a lad as fortunate ones, for it was then that I was introduced to—and took to heart—the sublime music and superb vocal performers of the pre-rock and roll Great American Songbook. Listening to it transported me away from my solitary existence into a sophisticated, grownup world of swell nightclubs, swinging orchestras, vocal champagne, the shimmer of romance, and the glorious singing of the incomparable Miss Ella Fitzgerald, the most talented popular female vocalist of the twentieth century. 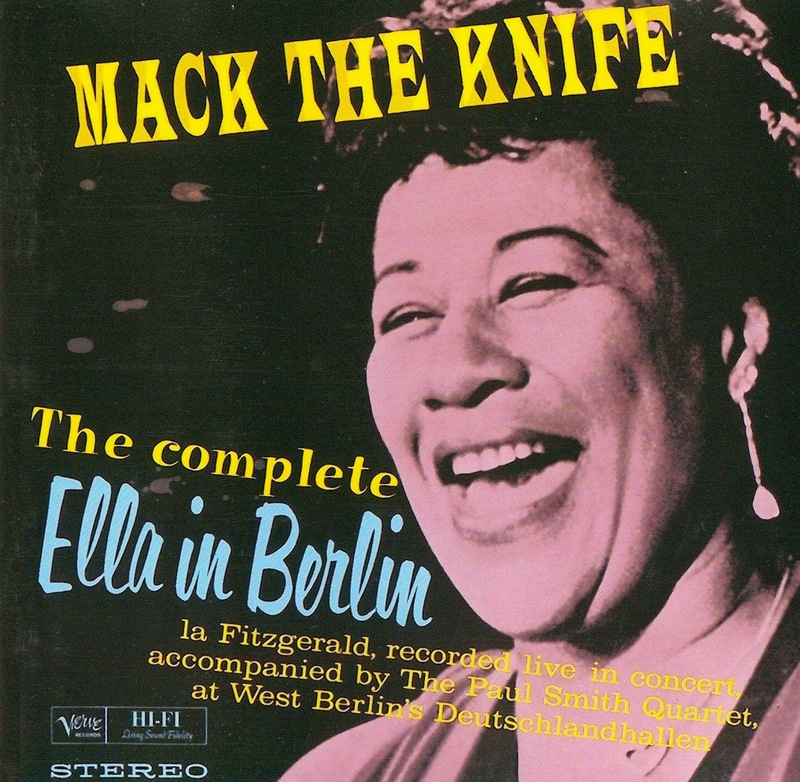 This is my absolute favorite Ella Fitzgerald album. 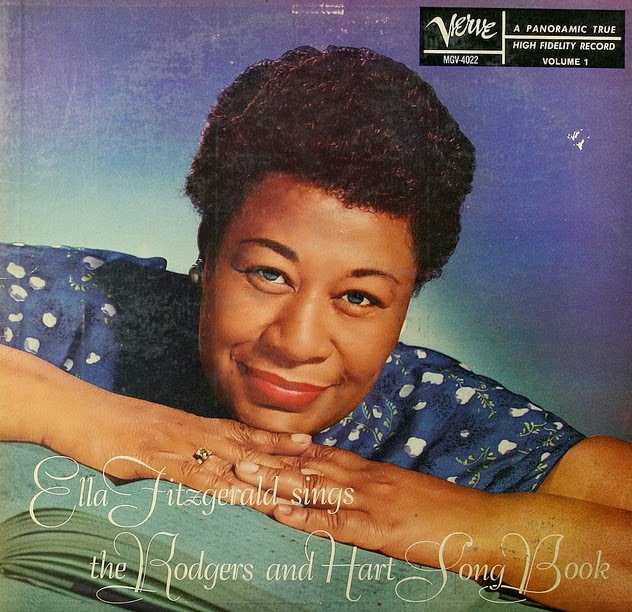 My love affair with Ella Fitzgerald has been a life-long one, and has continued unabated since I first came across that Cole Porter songbook album more than forty years ago. I was fortunate to see Miss Fitzgerald in concert three or four times, first as an undergraduate at Yale in the nineteen seventies, when she was still relatively in her prime, and last at Carnegie Hall in the nineteen nineties, when she was a very old and fragile lady. I will always treasure the memories of those concerts. Thank you, Miss Ella Fitzgerald, for befriending a young Reggie all those years ago, and for giving him so much pleasure then, and ever since. In today's post I reveal which of the five school of Duncan Phyfe games tables I bought during the Important Americana auctions held in New York this January. Of the forty-three Dear Readers who responded to my query (both here and on my FB page), the vast majority thought I bought either lot 369 (52%) or lot 383 (39%) in the Sotheby's sale. Only two of you (5% of respondents) correctly posited that it was actually lot 410 (the least "gainly" of the ones offered) that I ultimately brought home. The Sotheby's and Christie's Important Americana sales were held on Friday, January 24th, and Saturday, January 25th, with previews held during the week leading up to the sales. I was determined to make it to the previews, Dear Reader, to examine the school of Duncan Phyfe games tables discussed in my previous post, and I was fortunate to be able to slip away from my office the afternoon of the last day of the previews to do just that. My first stop, though, was at '21', where I had a leisurely lunch with an old friend—a most excellent way to start out such an enjoyable outing. I suggested to my friend that we meet at '21' because it is only a stone's throw from Christie's, where the best of the five games tables I was interested in looking at was on display. After bidding my lunching companion adieu I strolled over to Christie's just in time to look the table over, slipping into the exhibition room as the handlers were beginning to break down the preview ahead of the next day's sale. While I concluded the Christie's games table was certainly a very handsome piece, it did not get my juices flowing sufficiently to make me seriously consider leaving a bid for it. Besides, I knew it would sell well above my price range, so why even bother? I then hightailed it over to Sotheby's to take in their preview, which included the four remaining games tables, each with a supposed Duncan Phyfe connection, in which I was interested. As is typical of the Important Americana sales at both auction houses, most of the better furniture on offer at Sotheby's was of the late-eighteenth-century ball-and-claw variety. While I can appreciate the merits of such furniture, it is not of interest to Dear Old Reggie. No, I was there to check out the goods of the first quarter of the nineteenth century, also known as the Federal and Classical eras, which is the sweet spot of our collecting at Darlington. Fortunately there was a grouping of furniture and decorations from that period, where—not surprisingly—the four games tables I was interested in examining were to be found. The first table I came to examine was lot 383, the "Best" quality trick-leg table shown in the preceding photograph. While admittedly its form and execution was very fine (in auction parlance), there had been much restoration to the table, with the underside of the top largely rebuilt. That nixed it for me. Besides, we already own two similar form school of Duncan Phyfe tripod tilt-top tables at Darlington, which sit at either end of our sofa in our drawing room. 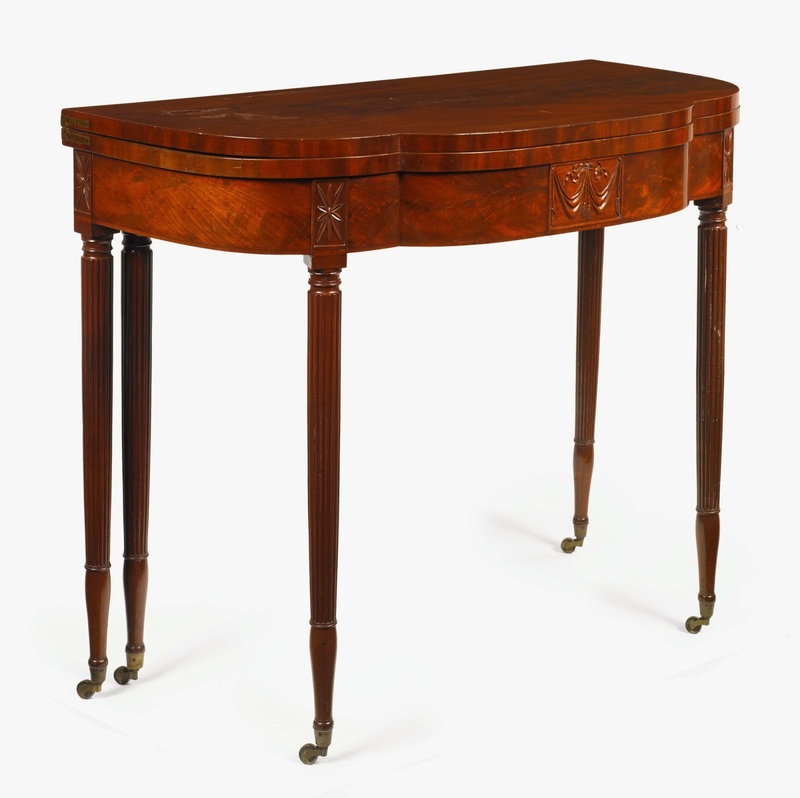 I next looked over lot 369, the five-legged games table on offer, but passed on it, too, because we already have a similar Pembroke-form table that we bought at Bernard & S. Dean Levy a decade or so ago. Looking around the room I then noticed lot 410, a table that I had dismissed when looking at Sotheby's online catalogue. Wait a minute, I thought—what about this one? Moving in to get a better look . . .
On closer examination I decided I liked the gutsy form of the pedestal games table with its four turned and carved columns rising out of a four-legged base. It was, admittedly, not as pretty or spare as lots 383 or 369, but it certainly had a lot of impact, and it wasn't in a form that we already owned. Hmmm . . . I wondered—could this be worth considering? By this time Boy had joined me at the preview. He was as surprised as I was to find that he also liked the pedestal games table, and preferred it to the others on display. After giving it a close once over, we then turned it upside down to examine its innards, as one should always do when considering buying an antique piece of furniture. Other than the replacement of the bottom of its concealed compartment, the games table looked "clean" to us, with the expected age, condition, and color one wants to see in such pieces. We were not all that concerned that the bottom of the compartment had been replaced, Dear Reader, and we were actually heartened that whoever had done so hadn't attempted to give it an unnatural aging, in an attempt to deceive. It was what it was—an obvious repair. But that's the only one we found. We left the preview asking ourselves if the columnar pedestal games table would be an appropriate addition to our collection of school of Duncan Phyfe furniture at Darlington, and if so should we bid on it? And how much should we bid? Over cocktails and dinner that evening we decided that it was worth a try, and so we returned to Sotheby's the next day to see whether we might be able to acquire it at a sufficiently reasonable price. The table we were interested in was one of the last lots in the sale. We arrived at Sotheby's well before it came up, and so had a lot of time on our hands to wile away before it did. Fortunately, in addition to watching the auction progress through the lots leading up to "our" table, there was a preview exhibition of Old Master paintings on the same floor to examine. 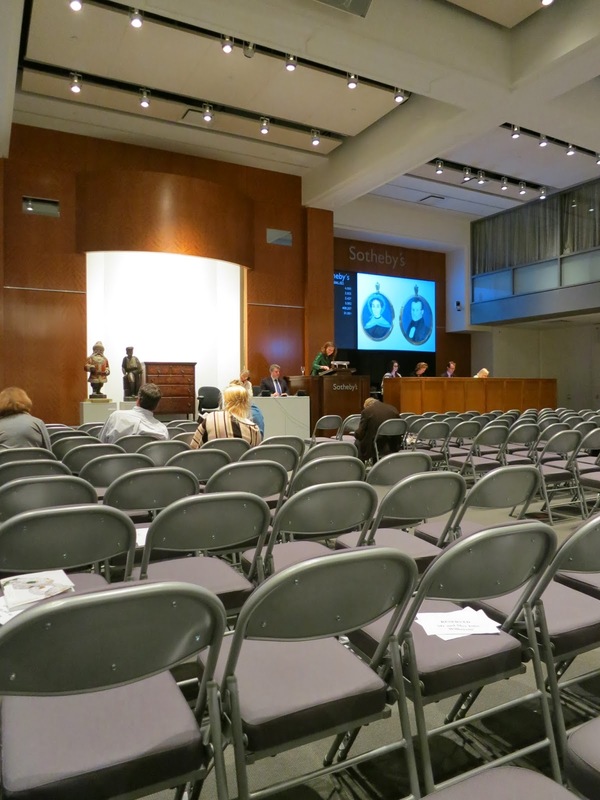 The auctioneer for the Sotheby's Important Americana sale was very professional and personable, and I have to give her a lot of credit for moving along what at times appeared to be a near-moribund room. She had her work cut out for her, Dear Reader. With the exception of a small number of lots that sold well above their estimates, almost everything in the sale either went within or below estimate, and in some cases well below estimate. That is, if it sold at all. A fairly high proportion of the lots on offer failed to meet their reserves and went unsold. While not exactly a blood bath, it was clearly not a great day for the auction house or the sellers it was representing. It was, on the other hand, a very good day for buyers as deals were definitely to be had. I found myself repeatedly amazed at how inexpensively many of the lots were being hammered down—in some cases at prices well below what one might pay for new, far-lesser-quality pieces of furniture. By the time lot 410 came up the room was largely deserted. 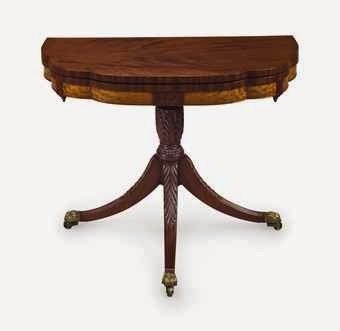 We were hopeful that we would be able to get the pedestal table at a good price, and were heartened that two of the games tables in the auction had been hammered down below their estimates (and one had been passed altogether). While we had come prepared to bid into the estimated $5,000-to-$10,000 range for the table, we were pleased to find ourselves in what can only be described as a half-hearted contest with only one other bidder, and we were exhilarated when the final hammer came down at $3,500 and the table was ours. Once we got the table into our city apartment and examined it more closely, we asked ourselves why was it that we were able to get it so inexpensively? Were we the late-in-the-sale lucky beneficiaries of a less-than-stellar auction where supply outstripped demand? Or had we bought a compromised, cobbled together mess that no one else wanted? What if the table was not of the first period at all, but rather a later reproduction? Upon closer examination, didn't we think the carving just wasn't crisp enough? We then asked ourselves, given the price we paid for the table (which is less than what a run-of-the-mill, cheaply-made one at Ethan Allen might cost), did we even care? And the answer was of course not—it was a bargain! If I'd paid two or three times what I did for the table I might get all worked up, second guessing myself endlessly on it. But since I didn't, I haven't, and I must say that I'm very pleased with this acquisition. I think our school of Duncan Phyfe columnar pedestal games table looks absolutely marvelous in our Snuggery at Darlington, where it fits right in with the other, somewhat bombastic American Classical furniture of the early nineteenth century, as well as some complementary English chairs. 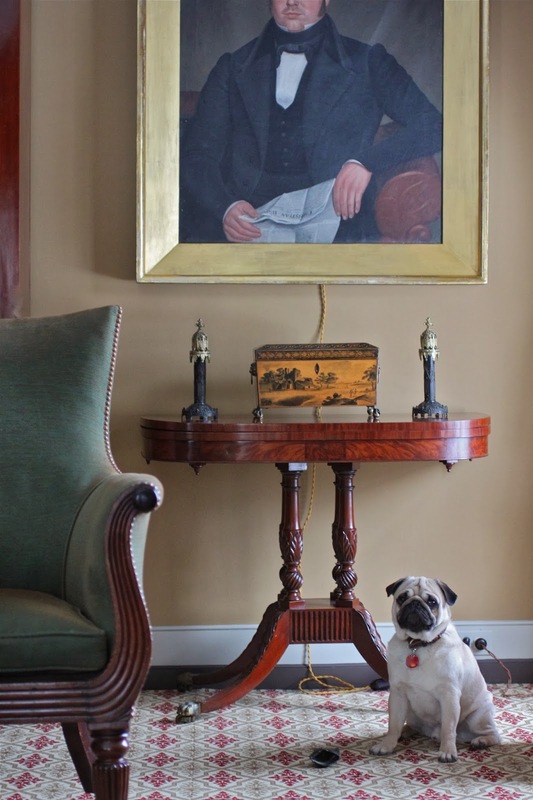 In fact, when we put "our" pedestal table against the wall in our Snuggery underneath a Sully-framed portrait and loaded it up with suitable period accessories, we thought it looked perfect, as if it had always been there. Which, to my mind, Dear Reader, is the sign of a successful acquisition. Don't you think so? There are very few known pieces of furniture that carry a label from the workshop of Duncan Phyfe (1768-1854), one of the leading cabinet makers in America during the early part of the nineteenth century. Only eight, to be exact. Almost all of the furniture produced in Phyfe's New York City workshop, from 1794 to 1847, is unlabeled. This has been a challenge to collectors, museum curators, and dealers in accurately identifying furniture as having been made by Phyfe's workshop. Compounding that difficulty is the fact that there were a number of cabinetmakers that were active in New York at the same time that produced furniture of similar quality, sometimes shared the same journeyman carvers, and often copied each other's work. Furthermore, there is a fairly large group of excellent reproductions (some of them meant to deceive) that were made during the Colonial Revival era. Given the difficulty in confidently attributing furniture to Duncan Phyfe's workshop, much of the pieces that could possibly have originated there that come up for auction or sale these days are identified as being of the school of Duncan Phyfe, or made by an equivalent workshop. When a piece has a provenance where there is a documented link between the owner and Duncan Phyfe's workshop—such as a bill of sale—then it can be accurately described as being attributed to Duncan Phyfe. Only when a piece of furniture actually carries a Duncan Phyfe label can it definitively be described as being made by Duncan Phyfe's workshop. We collect early-nineteenth-century New York Federal and Classical furniture at Darlington House, and we own half a dozen examples that are considered to be of the school of Duncan Phyfe, or by an equally competent competitor. I have written about our collection of such furniture in a number of posts, including one here. At this January's Important Americana sales at Sotheby's and Christie's, there were five examples of games tables that were catalogued as being either from the school of Duncan Phyfe or attributed to his workshop. Today's post examines those five tables and ranks them based on their quality and condition along the continuum of "Good" to "Masterpiece," as defined by Albert Sack (1912-1999) in his landmark reference book Fine Points of Furniture, first published in 1969 and revised and expanded in 1993.
games table, school of Duncan Phyfe. New York, ca. 1815. The table was in the Sotheby's Important Americana sale, held on January 25th, and is probably the least likely of the group I'm writing about to have been made in the Phyfe workshop. While the form is one that was known to have been produced by Phyfe, upon close examination the table's carving is the least crisp and well-executed of the group at the sales, which leads me to believe it was made by a nearly equivalent workshop, but not Phyfe's. I wonder if the games table may be a later, highly accomplished reproduction piece made in the latter part of the nineteenth century, or even possibly a marriage piece where the base didn't start out with the top. It's hammer price was only $3,500, Dear Reader, and well below its $5,000-$10,000 estimate, indicating that I am not alone in such speculation. Nonetheless, I would still rank this pleasing table's quality as "Better," using Mr. Sack's quality scale. The next table, also in the Sotheby's sale, is more likely to have been made in the Phyfe workshop, in my view, or by his equally competent competitors, the brothers Michael and Richard Allison. The table's carving is crisp and confident, and its proportions are excellent. I would rank this as a "Better Yet," or one gradation above the first table. I would have ranked it even higher than "Better Yet" if it had one or two more flourishes to its form, or more "oomph." 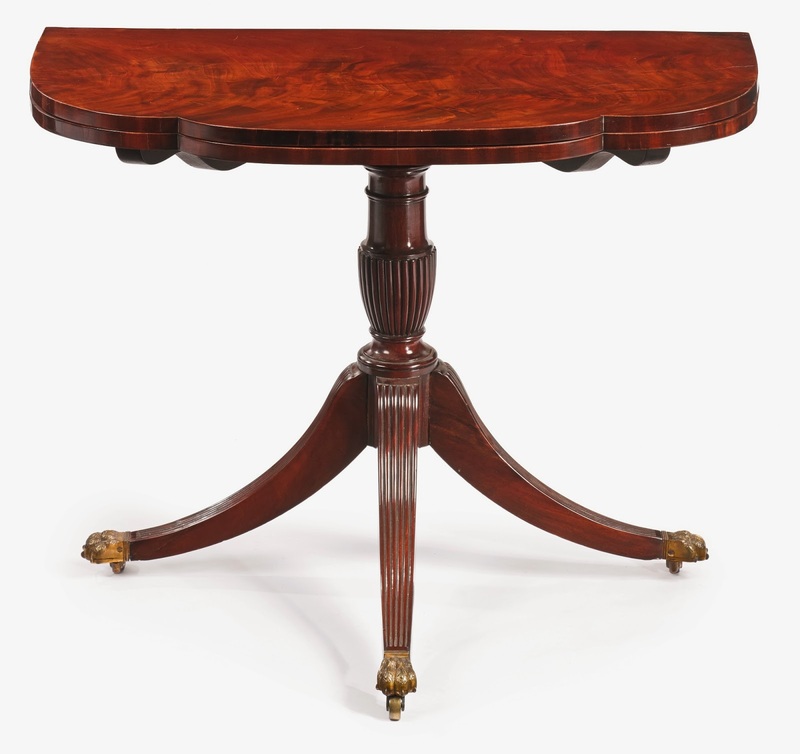 The table sold within its $5,000-$10,000 estimate, at $6,500. "trick-leg" games table, school of Duncan Phyfe, New York, circa 1815. 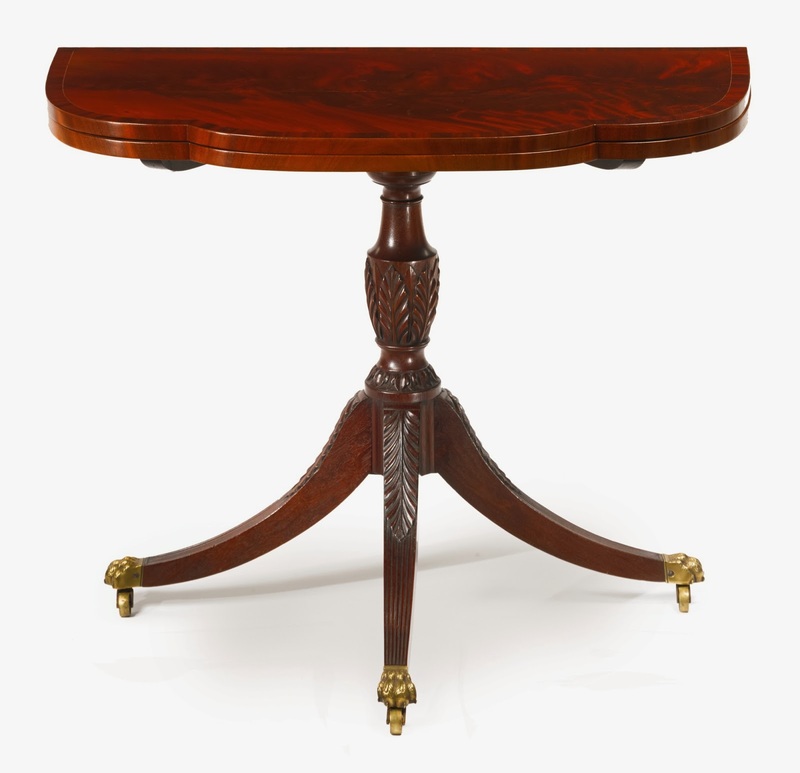 The third table, also in the Sotheby's sale, was in the much-desired "trick-leg" form, where an ingenious interior mechanism moves two of the table's legs when the top is opened to form a perfect, and stable, tripod base. The carving of this games table's fluting was crisp and well executed, and I have no reason to believe it was not made in the Phyfe workshop. I would rank this as "Better Still," or somewhere between "Better Yet" and "Best." 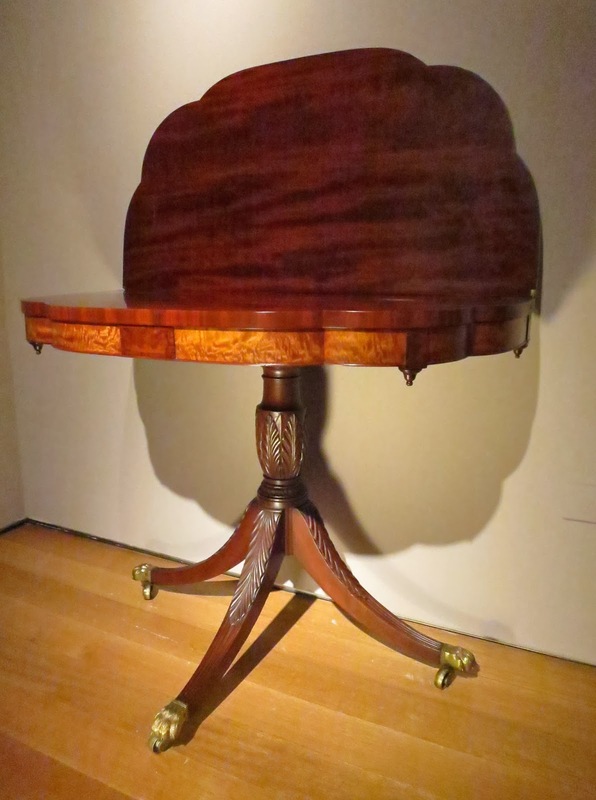 Condition issues, however, limited the desirability of the table (the top had come off and one of the legs was repaired), and it failed to reach its reserve price and was passed at $4,500. "trick-leg'' games table, school of Duncan Phyfe, New York, circa 1815. The fourth table, also auctioned by Sotheby's, is almost assuredly a product of the Phyfe workshop. Its carving is more masterful than the previous "Better Still" games table, with more complicated and virtuosic leaf carvings on the legs and the central pedestal (as opposed to mere fluting on the previous example). The quality of the mahogany was also excellent, with a vivid, almost plum pudding top. I would rank this games table as the "Best" in its category. It's got it all. 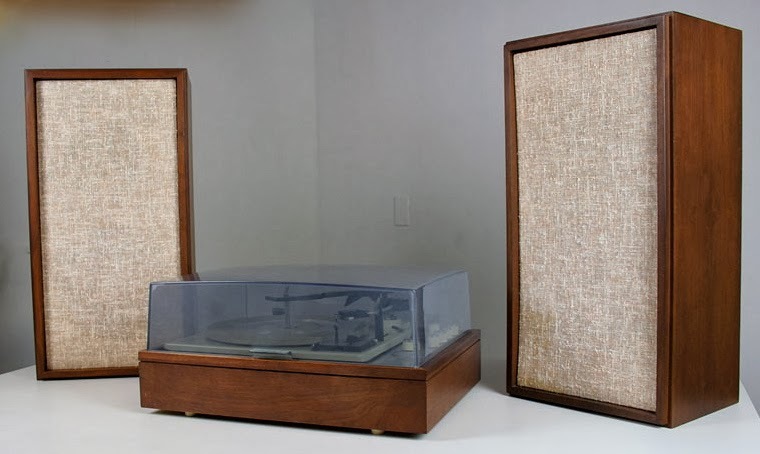 Condition issues, including what appeared to be later repairs to the underside of the table top, meant that it did not achieve the low end of its $8,000-$12,000 estimate, but it it did sell for $5,500. Christie's lot 147. 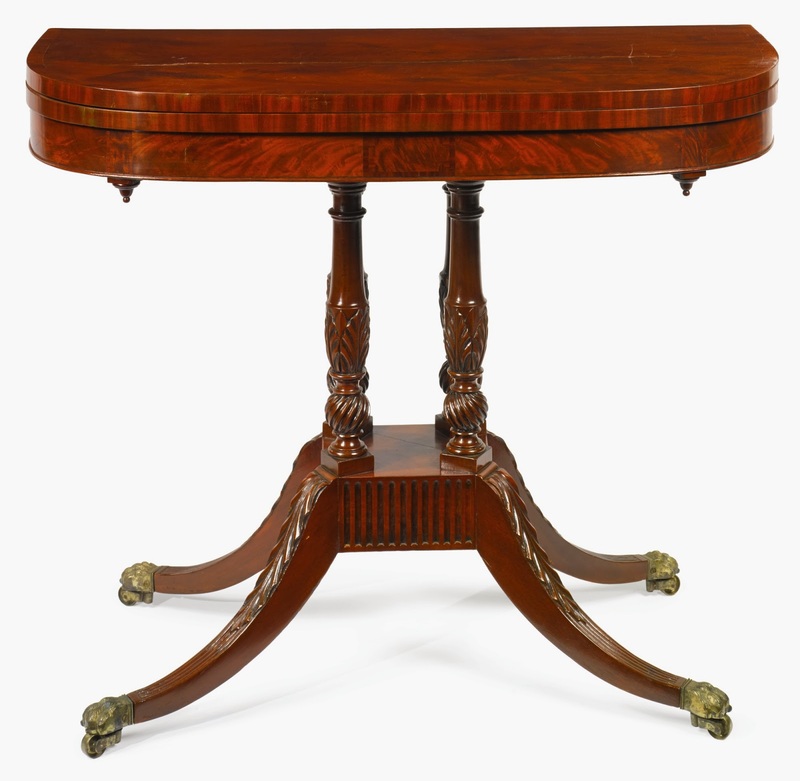 A Federal mahogany treble-elliptical "trick-leg"
card table, attributed to Duncan Phyfe, New York, 1800-1820. The final games tables shown was the only one offered by Christie's and was the best of the lot, by a wide margin. Christie's cataloged it as attributed to Duncan Phyfe's workshop (as opposed to school of), and it had all the bells and whistles one could possibly want in the form: it was a trick-leg, it sported a treble-elliptical top (instead of the more common double-elliptical form), it had a contrasting satinwood apron (vs. none or one of mahogany), it had a beautifully mottled table top, and its legs and central pedestal were decorated with intricate and superbly executed leaf carvings. I would rank this as a "Superior" (as defined by Albert Sack) and the highest ranking of the five tables shown here. It is only one step short of the "Masterpiece" pinnacle of the continuum. Not surprisingly, the Christie's games table realized the highest price of any of the tables offered during the sales, hammered down at $15,000, or right in the middle of its $12,000-$18,000 estimate. If I had been feeling particularly flush during the sales, Dear Reader, I might have considered bidding on the Christie's table. I wasn't, however, so I consoled myself with buying one of the other, lesser tables offered, for our Snuggery at Darlington House. 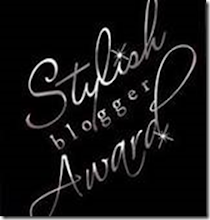 I'll divulge which one it is in my next post. Tell me, which one of these tables do you like the best? And which one would you buy if price was not a consideration? Photographs courtesy of Sotheby's and Christie's.